The space shuttle Endeavour docked to the International Space Station for its final visit Wednesday (May 18). This story was updated at 8:23 p.m. EDT. HOUSTON — The space shuttle Endeavour arrived for one last visit to the International Space Station this morning after a two-day orbital chase. Endeavour and its six astronauts docked at the orbiting laboratory at 6:14 a.m. EDT (1014 GMT). "Endeavour arriving," space station astronaut Paolo Nespoli of the European Space Agency said as the shuttle connected with the outpost. It took the crews on both the station and shuttle about two more hours to open the hatches between their two spacecraft, as they had to check carefully for any leaks in the seal. Finally around 8:12 a.m. EDT (1212 GMT), the doors were open and the shuttle astronauts floated through. "Hey, you guys wore coordinating shirts, we didn't do that," said shuttle commander Mark Kelly as he climbed aboard the space station. "It's good to be back. It looks pretty much the same." Kelly last saw the International Space Station in 2008 on his STS-124 shuttle mission. As the shuttle astronauts floated through the hatch to where the station crew was waiting, the spaceflyers welcomed each other with hugs and handshakes. Their addition to the space station will double the outpost's population. Currently living aboard the station with Nespoli as part of the Expedition 27 mission are commander Dmitri Kondratyev of Russia, and flight engineers Ron Garan and Catherine (Cady) Coleman of NASA and Russian cosmonauts Alexander Samokutyaev and Andrey Borisenko. The station residents were apparently excited to have visitors. "Yoo Hoo house-guests!" Garan wrote via Twitter on Tuesday. The main goal of Endeavour's final mission is to deliver an astrophysics experiment called the Alpha Magnetic Spectrometer to the International Space Station. At $2 billion, it's the most expensive science experiment ever flown to the station, and offers the potential to solve numerous cosmic mysteries such as what forms the invisible dark matter thought to pervade the universe. Endeavour is also packed full of spare supplies, including extra ammonia coolant, antenna systems and parts for the station's Dextre robot, that will help outfit the space station after the shuttles retire. The shuttle's crew plans four busy spacewalks and a host of intensive robotic arm maneuvers to stow the parts and perform maintenance to the exterior of the station. Endeavour's astronauts are working the overnight shift during their mission. The crew woke Tuesday evening at 10:56 p.m. (0256 GMT Wednesday) to the song "Drops of Jupiter" by the band Train. The tune was selected for Johnson by his family and radioed up to the shuttle by Mission Control. "I love that song and I love being in space," Johnson said, thanking his teenage son Matt for the choice, and apologizing for missing his birthday, which is tomorrow. "And I want to say that's a perfect way to start an exciting rendezvous day!" The astronauts spent yesterday, their first full day in space, conducting a detailed inspection of their orbiter's heat shield tiles to check for any damage that might have been suffered during launch. 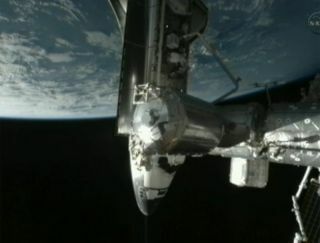 So far, the sensitive tiles appear to be in good shape to protect the shuttle from the fiery heat of re-entry to Earth. "Preliminary assessment is it looks really good so far," LeRoy Cain, head of Endeavour's mission management team, said in a news briefing Tuesday. "We're not tracking any issues as far as that's concerned." Another check of the heat shield will be available soon, when Mission Control has a chance to analyze high-resolution photos taken of the shuttle's underbelly as it approached the station. When Endeavour was about 600 feet (180 meters) below the space station, commander Kelly steered the shuttle through a backflip that exposed the orbiter's heat shield to the station, allowing astronauts there to snap hundreds of detailed images. The operation is called the Rendezvous Pitch Maneuver. Analysis of the photos should be complete in the coming days.